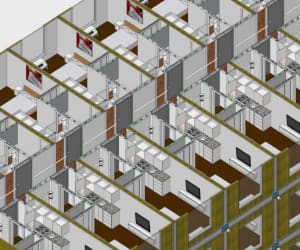 Modular construction has become a staple of many design disciplines. Not only does modular construction enable easier fabrication, but it also reduces the cost of construction and can accelerate production schedules. Though modular construction has been a key to modern design, it doesn’t come easy. For modular construction to occur, firms like Vector Praxis has to develop specific elements, like innovative cast steel connectors, that will tie a design together. To build these multi-purpose, modular elements, Vector Praxis has to have access to the most advanced CAD tools that include 3D modelling, simulation and easy-to-use PDM. How to reduce design times when building modular elements. How 3D CAD will speed up the development of critical design elements. How simulation can be critical to building a product that can withstand any test.